After three days of intense play, the 2013 World Series of Poker Event #13: $5,000 Seven-Card Stud Hi-Low 8-or-Better has come to an end. What started with 210 players on Wednesday ended in the early morning hours of Saturday with Mike “The Mouth” Matusow emerging victorious over a stacked final table to win his fourth gold bracelet and the accompanying $266,503 first-place prize. Matusow, who won the NBC National Heads-Up Championship for $750,000 back in January, had an up-and-down day on his way to victory, which included beating Matthew Ashton in an concentrated heads-up battle. Ashton, who finished third in Event #5 $2,500 Omaha/Seven-Card Stud Hi-Low 8-or-Better for $86,437 less than a week ago, just missed out on another bracelet, but he had $164,700 in prize money to serve as consolation. The third and final day saw the final 20 players return to battle down to a winner, and it didn’t take long for the eliminations to mount. 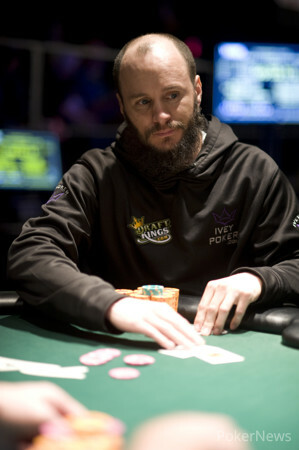 Within minutes of the day's start, Russia's Ognjen Sekularac departed in 20th place, and he was soon followed out the door by Will Thompson (19th - $9,583), Timothy Finne (18th - $9,583), Joe Tehan (17th - $9,583), Brian Hastings (16th - $11,528) and Eli Elezra (15th - $11,528), who were actually eliminated on the same hand. Ryan Miller also joined them on the rail in 14th place for $13,877, and that was all before the first break of the day! Ryan Miller also joined them on the rail in 14th place for $13,877, and that was all before the first break of the day! Over the course of the next two levels, "Crazy" Marco Johnson (13th - $13,877), Richard Chiovari (12th - $17,025), Jose-Luis Velador (11th - $17,025) and Eric Rodawig (10th - $21,190). Mike Leah completed showing the and Rodawig raised. Leah made the call and then bet when he paired that seven on fourth. Rodawig called off his last 17,000 and showed , which gave him a good shot at a low. Leah showed the . After the board ran out, Leah received the on seventh to make an eight-seven low to go with his pair of sevens, but it wasn't needed as Rodawig somehow missed everything and ended with king high after receiving the on seventh. Rodawig exited in tenth place for $21,190. After Tuan Vo was eliminated in ninth place, the official final table was set with Yuval Bronshtein leading the way and Vladimir Shchemelev on the short stack. Not surprisingly, the Russian didn’t last long, just four hands at the final table in fact. Twelve hands later, one of the fan favorites in Gavin Smith followed him out the door in seventh place. Sixth-place "honors" went to none other than Tony Cousineau, who fell on Hand #61. Cousineau was down to just 2,000 in the first level of the day, which was barely enough to pay the antes, but managed to make a nice comeback. Nonetheless, he was surely disappointed to finish in sixth and add to his streak of most WSOP cashes, now at 55, without a WSOP bracelet. Surprisingly, Bronshtein joined him on the rail two hands later and extended his own cashes without a bracelet to 22. Four-handed play was an extended affair, 79 hands to be exact, but eventually two-time bracelet winner David “Bakes” Baker was eliminated. That brought about three-handed play, which lasted for two hours before Leah ducked out in third. Heads-up play began with Matthew Ashton, who was celebrating his birthday, holding a 2-1 lead over Matusow, but “The Mouth” was soon able to even up the stacks. Before long he took the lead and there was no looking back. 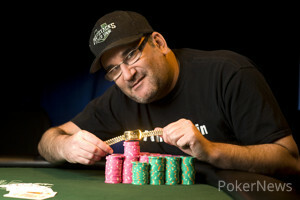 Congratulations to Mike "The Mouth" Matusow on winning his forth gold bracelet! That does it for our coverage from Event #13: $5,000 Seven-Card Stud Hi-Low 8-or-Better, but there are still plenty of events to follow throughout the summer. See you then! Hand #289: Matthew Ashton brought it in with the and then called when Mike Matusow completed with the . Matusow kept the pressure on with a bet on fourth street, Ashton raised and Matusow reraised. Ashton called off with a pair of deuces and was looking to overcome Matusow's pair of nines. One by one the cards were given to each player, and neither improved until seventh. Matusow caught a king to improve to two pair, and while Ashton caught an eight to also improve to two pair, it wasn't enough to overcome "The Mouth's" kings and nines. Hand #274: Mike Matusow brought it in with the and then raised when Matthew Ashton completed with the . Ashton check-called a bet on fourth before both players checked fifth. Matusow checked sixth and then raised when Ashton put out a bet. Ashton made the call and then called one final bet on seventh. "Flush and six low," an excited Matusow said while tabling the . Ashton took one last look at his own cards and then sent them to the muck while Matusow stood from the table and raised his arms in celebration. Hand #263: Matthew Ashton brought it in with the and then called when Mike Matusow completed with the . Ashton proceeded to call bets on the next three streets before both players checked on seventh. Matusow tabled the for a pair of kings, and it was good as Ashton sent his cards to the muck unseen. Hand #249: Mike Matusow brought it in with the up and then raised when Matthew Ashton completed with the . Ashton called and then check-called a bet on fourth. When Ashton paired his ace on fifth, he led out and it was Matusow's turn to call. The came action occurred on sixth street and then both players checked seventh. Matusow tabled the for ten and sixes, and Ashton simply mucked. "I caught the ten on the end," Matusow said with a smile on his face. Hand #244: Mike Matusow brought it in with the up and then raised when Matthew Ashton completed. Ashton called and then check-called bets on every street. Matusow tabled the for a straight and a low, which was good enough to scoop the robust pot. 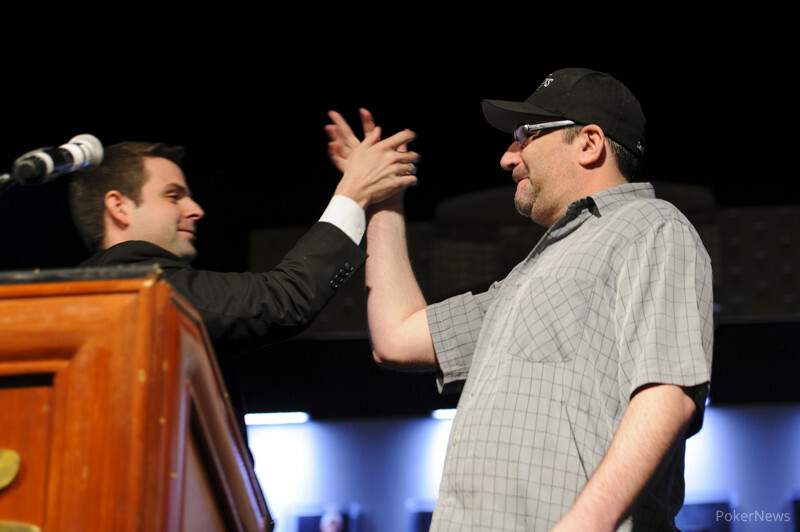 Hand #240: Mike Matusow brought it in with the showing and raised when Mike Leah completed. Leah called off the remainder of his stack and the cards were tabled. Fourth gave Leah a big lead for the high, but running fours on fourth, fifth and sixth streets gave Matusow trips. Leah seemed to know his days were numbers and was gathering his things even before seventh street was dealt. Matusow showed that he didn't improve, which meant Leah could stay alive with an ace on seventh. He wasted little time in grabbing the card and turning over the , the last card he will see in Event #13 $5,000 Seven-Card Stud Hi-Low Eight-or-Better. 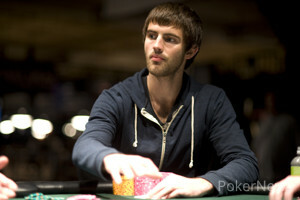 Hand #237: Mike Matusow brought it in and then called when Matthew Ashton completed. From there, Ashton check-called a bet on fourth before both players checked fifth. Ashton checked for a third time on sixth and folded when Matusow bet. Which Story Line will Come to Fruition on Day Three?